Practicing yoga can help unite the mind and body in a way that fosters health and well-being. Numerous studies have shown that yoga positively affects the body’s musculoskeletal, circulatory, endocrine and nervous systems. Yoga can also increase muscular strength, balance , flexibility, precision of movement and tonicity while reducing the risk of injury commonly found in contact sports and high-impact exercise. Additional good news! Yoga’s influence on health is gaining increased recognition in mainstream medical circles. Studies from the Harvard Medical School and University of Massachusetts Medical Center conclusively show that yoga and meditative relaxation boost immunity, reduce stress and aid in the healing of many chronic illnesses. This is why many prestigious hospitals and wellness centers now offer yoga classes to their patients. Powerful proof that yoga is beneficial to our health! Ready to give it a try? Yoga helps keep the immune system strong on a day-to-day basis using poses, asanas, to lower stress hormones that compromise the immune system. It also strengthens your resistance to viral and bacterial intruders that lead to infection. Recommended asanas (like Downward Facing-Dog, Camel Pose, Child’s Pose, Supported Bridge, Cobra Pose, Back Bends, Forward Bends and Twists) also condition the lungs and respiratory tract, stimulate the lymphatic system to release toxins and bring clean, oxygenated blood to the organs. If you have difficulty falling asleep, stress is a likely culprit. 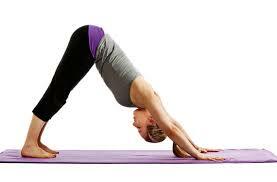 Regular asana practice can reduce tension and help you wind down when it is time for bed. Calming asanas such as forward bends, twists, simple inversions, lying with your feet elevated or up on the wall and gentle breathing can all help with insomnia. When it comes to back pain, consistent stretching of the low back and hamstrings are your best bet. Backaches can result from injury, overuse or mis-use, but the prime culprit often lies in mis-alignment. A constant tug-of-war between your abdominals pulling the pelvis forward and the hamstrings counter pulling the pelvis back. Yoga poses like the Wide Leg Standing Forward Bend give the spine and opportunity to lengthen horizontally while the hamstrings and inner thigh muscles lengthen vertically, thus reducing pressure on the back. Another good way to stretch the low back is to lie down while drawing your knees into the chest and lifting your nose toward your knees (like giving yourself a big hug). Mild to moderate carpal tunnel syndrome (CTS) can be treated with asanas that facilitate wrist rejuvenation and counteract repetitive movements, stress and strain on the upper back, neck, shoulders, hands, arms and wrists. A regular practice of yoga can strengthen these areas and reduce overall physical stress by teaching you how to be aware of your posture, alignment and breathing – how to sit, lift, stand and stretch – when performing activities that contribute to CTS. Blurry vision, distorted vision and stinging dry eyes are common in individuals who sit at a computer or mobile device for more than three hours at a time. It is also common in individuals who study, read or do paper work for extended periods without a break. The best remedy – dim the lights, lie down and take a break. If you are in an office setting and you cannot lie down, force yourself to get up and stretch at least once for every hour spent at the computer. Close your eyes, quiet your mind, practice deep breathing and let your mind relax!